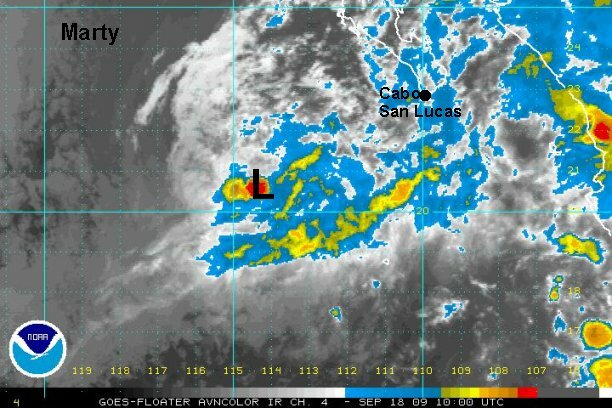 After slowly organizing, it appears that a new tropicall depression has formed southwest of Cabo San Lucas. Quickscat satellite estimates of earlier today had tropical storm force winds, but not really a closed off low. 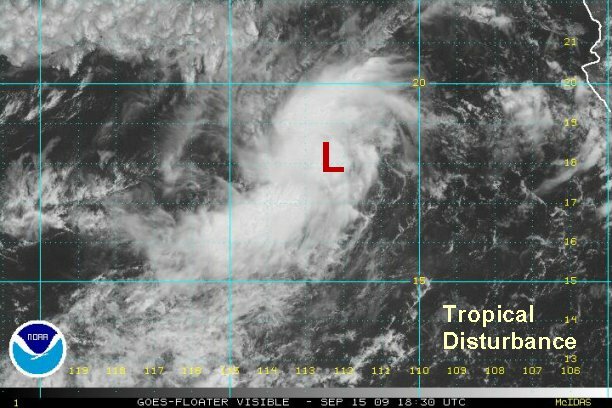 We now believe that the low is closed off and that a tropical depression has formed. Tropical storm Marty should be classified within the next 12 hours if development continues. As of 3:00 pm edt / 12:00 pm pdt the tropical disturbance was centered near 18.0° N / 112.5 W or about 365 miles southwest of Cabo San Lucas, Mexico. Top sustained winds are estimated at 35 mph and increasing. It is moving northwest at about 10 mph. Forecasts generally keep this system a few hundred miles west of the Baja, although a few are closer. Due to the relatively high latitude already, this new system won't have too much time to develop before entering cooler water. It appears that the Hurricane Center will need to skip the tropical depression phase and declare this "tropical disturbance" - tropical storm Marty. In all likelyhood they will call it a tropical depression at 2 am pdt and then name it at 8 am pdt. Satellite imagery has shown a deep burst of convection over the center of circulation for the past several hours now. We believe that this system is a minimal tropical storm. Quickscat shows a closed low pressure system with 40 knot winds. As of 3:00 am edt / 12:00 am pdt the "tropical disturbance" was centered near 18.4° N / 113.5 W or about 385 miles southwest of Cabo San Lucas, Mexico. Top sustained winds are estimated at 45 mph and increasing. It is moving west northwest at about 5 mph. Forecasts still generally keep this system a few hundred miles west of the Baja, although a few are closer. Due to the relatively high latitude already, this new system won't have too much time to develop before entering cooler water. It may be close enough to the southern Baja to bring rain. Re: Marty southwest of Cabo? Updated previous post to add official NHC track and advisory...... td16E classified at 2 am pdt. We'll, NHC upgraded to tropical storm Marty at 8 am pdt just as we suspected on our morning update. It looks like Marty is already being sheared by easterly winds. In addition with the easterly wind, the low appears to be tilted. The surface low is a little to the east of the mid level low. Marty looks to have a short life span with shear and cooler water facing it. As of 4:00 pm edt / 1:00 pm pdt tropical storm marty was centered near 18.7° N / 113.0 W or about 345 miles southwest of Cabo San Lucas, Mexico. Top sustained winds are estimated at 45 mph (NHC 40 mph). It is moving west northwest at about 3 mph. Wind shear continues to play a role in keeping Marty's strengthening in check. 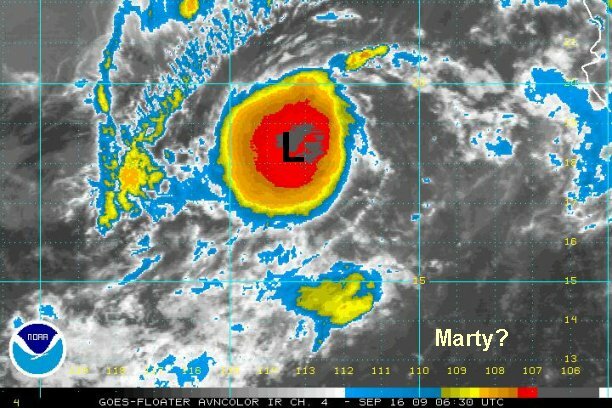 Despite a big burst of convection near and southwest of the circulation center, Marty is status quo. Easterly winds aloft are presently not allowing for addtional strengthening. As of 11:00 pm edt / 8:00 pm pdt tropical storm marty was centered near 19.2 N / 112.7 W or about 315 miles southwest of Cabo San Lucas, Mexico. Top sustained winds are estimated at 45 mph (NHC 45 mph). It is moving north northwest at about 3 mph. The heavy showers and storms near the center of circulaton have decreased over the past several hours. 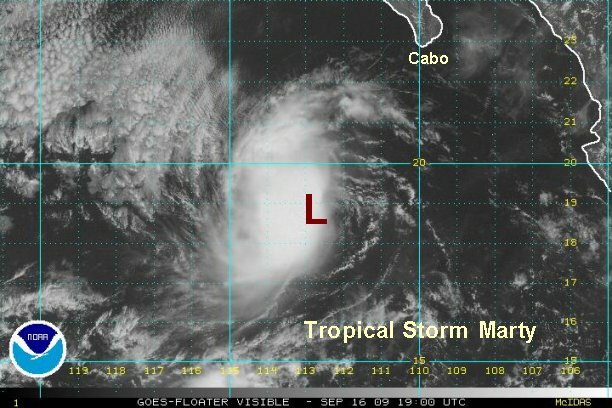 It appears that Marty is holding on as a minimal tropical storm. Some new convection is trying to build over the last one or two hours. Marty seems to be destined to a short weak life. As of 7:00 am edt / 4:00 am pdt tropical storm marty was centered near 19.8 N / 112.9 W or about 290 miles southwest of Cabo San Lucas, Mexico. Top sustained winds are estimated at 40 mph (NHC 45 mph). It is moving north northwest at about 5 mph. Forecasts still generally keep this system a few hundred miles west of the Baja, although a few are closer. Due to the relatively high latitude already, this new system won't have too much time to develop before entering cooler water. It may be close enough to the southern Baja to bring a little rain, mostly just high and mid clouds. Marty has essentially changed little at all today. It is drifting to the north north west. Deep convection has increased some, so we increased the winds a touch. 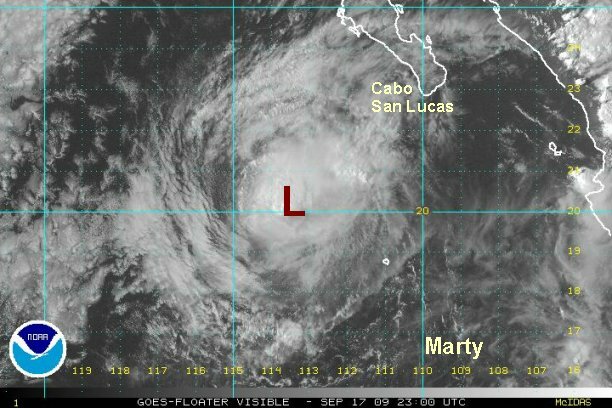 As of 8:00 pm edt / 5:00 pm pdt tropical storm marty was centered near 20.1 N / 113.2 W or about 280 miles southwest of Cabo San Lucas, Mexico. Top sustained winds are estimated at 45 mph (NHC 45 mph). It is moving north northwest at about 3 mph. Latest forecasts weaken Marty and gradually turn it more northwest away from the southern Baja. Deep convection has decreased markedly overnight. A new very small burst is near the circulation center. We think that Marty is a little under tropical storm strength. NHC has it forecast at 35 mph by 8 am pdt and will likely follow at that time. 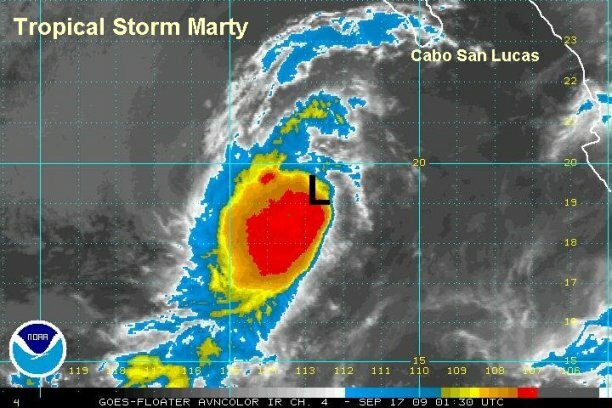 As of 7:00 am edt / 4:00 am pdt marty was centered near 20.5 N / 114.3 W or about 340 miles west southwest of Cabo San Lucas, Mexico. Top sustained winds are estimated at 35 mph (NHC 40 mph). It is moving northwest at about 5 mph. 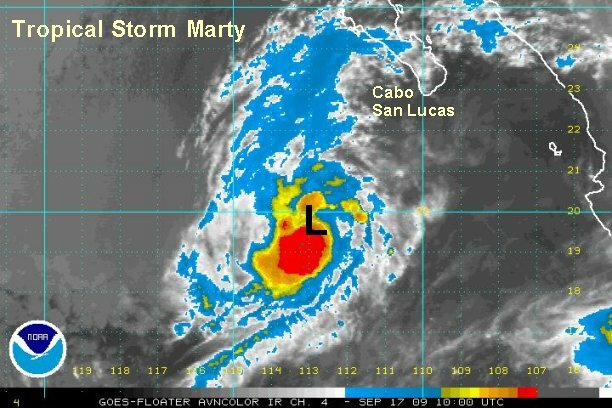 Latest forecasts weaken Marty and continue to move it northwest away from the southern Baja. The last deep convection is barely holding on north of the circulation center. Quickscat satellite estimates from early today suggest about 30 knots. Seas up to 10' a possible near the low center, and 3-5' near the Baja. 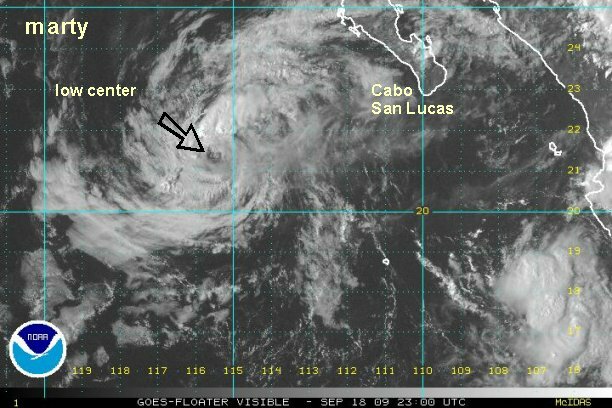 As of 8:00 pm edt / 5:00 pm pdt marty was centered near 21.5° N / 115.6° W or about 375 miles west southwest of Cabo San Lucas, Mexico. Top sustained winds are estimated at 35 mph (NHC 40 mph). It is moving northwest at about 7 mph. Marty will continue to weaken and not threaten the Baja. The National Hurricane Center finally has Marty down to 35 mph too. Marty continues to move northwest away from the Baja with occasional little bursts of thundershowers near the circulation center. This will gradually decrease as Marty moves over progressively cooler water. This will be our last update on Marty.